Robert LaJeunesse looks beyond the 20th century arguments for shortening the work week. He writes a careful, convincing critique of traditional full employment policies in advocacy of an alternative macroeconomic paradigm. 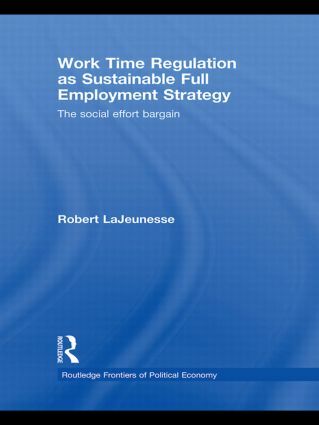 With an emphasis on greater socioeconomic participation, the author proposes a policy of work time regulation that is not only appropriate for a 21st century post-industrial economy, but speaks to concerns about balancing work and family, environmental sustainability, stabilizing incomes and prices, and social and economic well being. Through its unique conceptualization of employment relations as a social effort bargain, this book proposes that governments can achieve egalitarian and sustainable macroeconomic objectives by regulating work hours. Equally important to achieving sustainable full employment and price stability, work time regulation offers the capability for citizens living in an age of abundance to define themselves as something other than paid employees. Work time reform represents a first step in a process of enlightenment in which workers will create an identity through the whole of their relationships at work, home, community, and at play. There is certainly a role for government in fostering the pursuit of "loftier ideals" subsequent to a redistribution of work time, but the first precondition for enhanced human development is greater socioeconomic participation, which means more paid work for some and less for others. In addition to students and researchers in economics, sociology, and political science, this book will be of interest to policy makers, policy analysts, labour unionists, environmentalists, and other social reformers.